I laugh, but my donkey isn’t cooperating much either. I’ve just barely got my feet in the stirrups and she’s already thumped on well beyond the group. “Don’t worry, she knows where she’s going,” the Bedouin shouts after me. 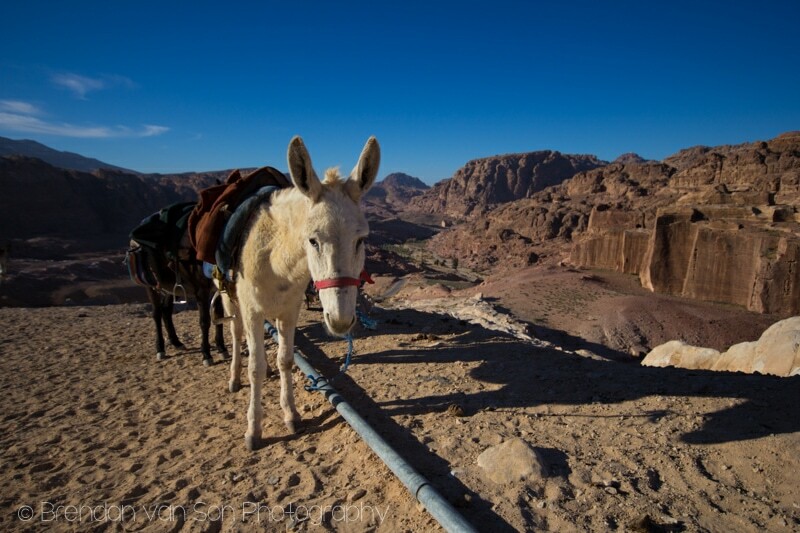 The stubborn donkey leads me from the edge of the Bedouin village down into the ancient city of Petra. I’m immediately surrounded by history. We bump and bop through the city, still void of tourists this early in the morning, as the morning light spits through the rock walls that surround it. I’m encircled by tombs, Roman columns, and a type of spirituality that can only be felt in places this deep in history. I keep blinking my eyes. I can’t help but feel like I’m dreaming, and after thanks to a lack of sleep, partly as a result of seeing Petra by night the previous evening, I might well be. Our now cohesive team of donkeys quickly leaves the tourist-zone of Petra and sluggishly bumps up the hills into the moon-like landscape. 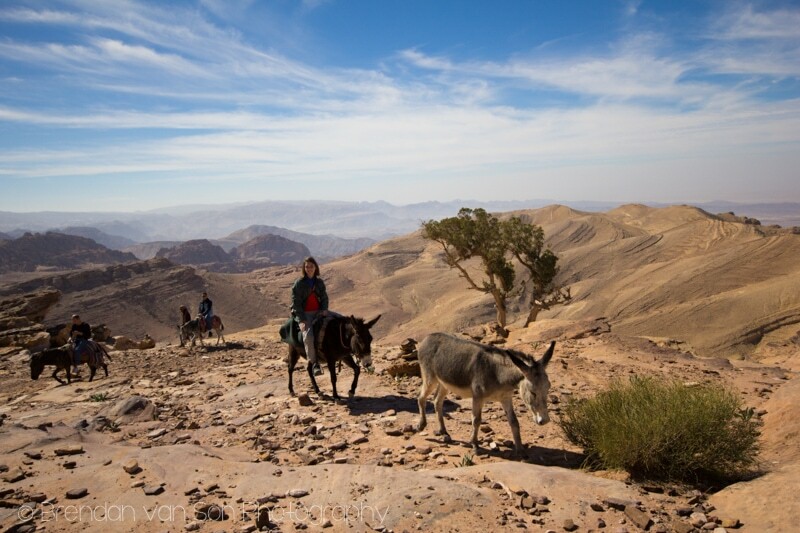 We’re donkey trekking to what’s believed to be Aaron’s (Haroun’s) Tomb, and what is unarguably the best view in Petra. Within 15 minutes, we feel ages from modernity. Our guide points to the caves and mentions that people are living within them to this day. 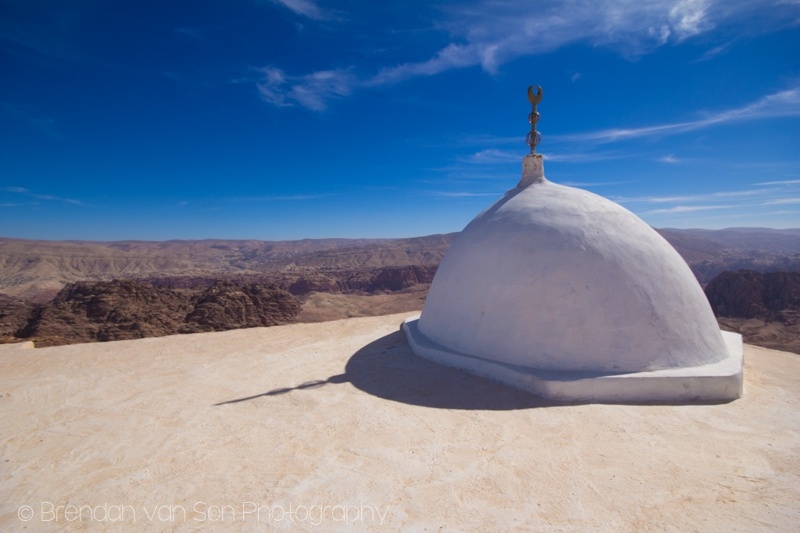 They have television sets, and some electricity, but they choose life out in the abandoned tombs on the outskirts of Petra rather than in the town that the Bedouins were moved to once they were told they could no longer live in the ancient city itself. Kids, completely apathetic to the sight of a tourist on a donkey, stand out on the smooth red rocks of the canyon looking out into the distance, without a care in the world. Occasionally, a donkey or camel caravan steps past us in the other direction. From time to time, my donkey decides it’s fed up with walking and stops for a moment’s reprieve. 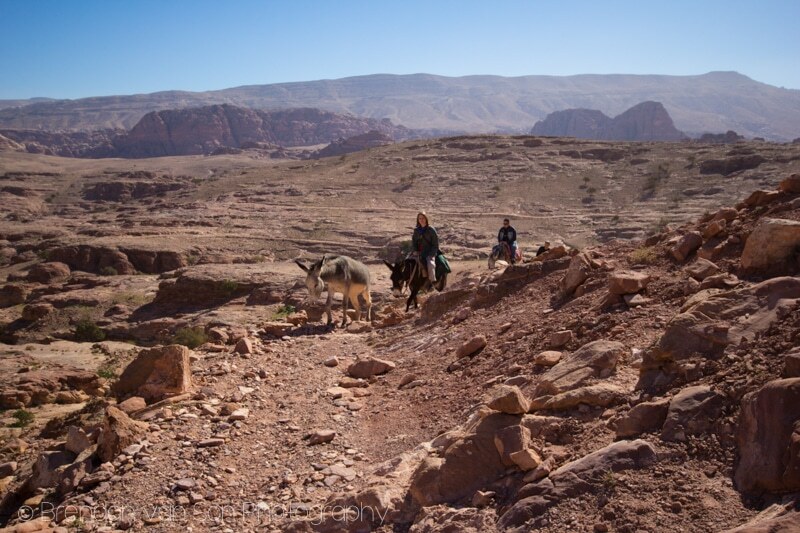 Our Bedouin group leader yells what I hear as the word “heroin” which sends the donkey into a full on sprint up the steep slopes. I can now see the white speckle of stone on the top of a peak ahead that’s meant to be Aaron’s Tomb. It seems like miles away, and many more up. I can’t help but be amazed at my donkey’s ability to climb. Though I hardly feel much bigger than her, she pulls myself, and a saddle full of snacks, up treacherous rocky steps without much of an effort. There are times we twist up cliff edges where a slight stumble would send us all down to a messy end. But my donkey is cautious, and sure-footed. I begin to trust her movements, even if there are times I am reminded that her slight annoyance with me could result in a buck tossing me some 200 feet below. 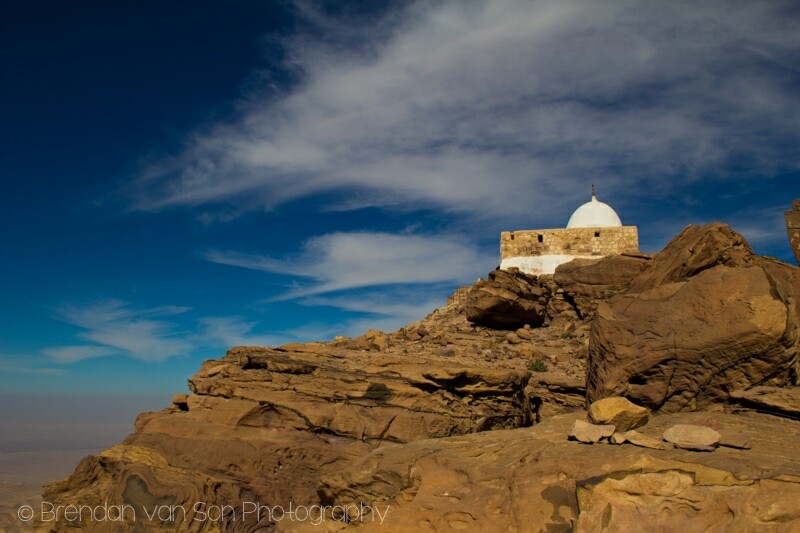 Eventually, we arrive at the base of the mountain, set our donkeys to rest beside a pool of fresh water, and scramble the last 100 meters to Aaron’s Tomb. Exhausted, we set our eyes on a view most certainly worth the heart attacks and sore backsides it took for us to get here; although I’m fairly sure our donkey’s don’t feel the same way. Looking down on the world below, it looks like a skeleton of rock and sandy flesh. Spines of hilly intrusions pierce into the landscape like needles below. Round mounds of rose-coloured hills roll completely arid and devoid of tree. Clusters of grayed green shrubs spot the landscape occasionally giving contrast to the otherwise red-world below. We can see for miles from here at Aaron’s Tomb. To the west, we can see all the way to Israel. On the way down, the donkey again does it’s best to commit suicide with Ibrahim on it’s back. The ride down is again terrifying. At one point, my donkey has to step down a couple feet, put her front feet on the edge of a cliff, and then jump while twisting her back legs as she drops down. I can feel my body lurch slightly over the edge. I look down at my now white fingers gripping desperately at the reigns. 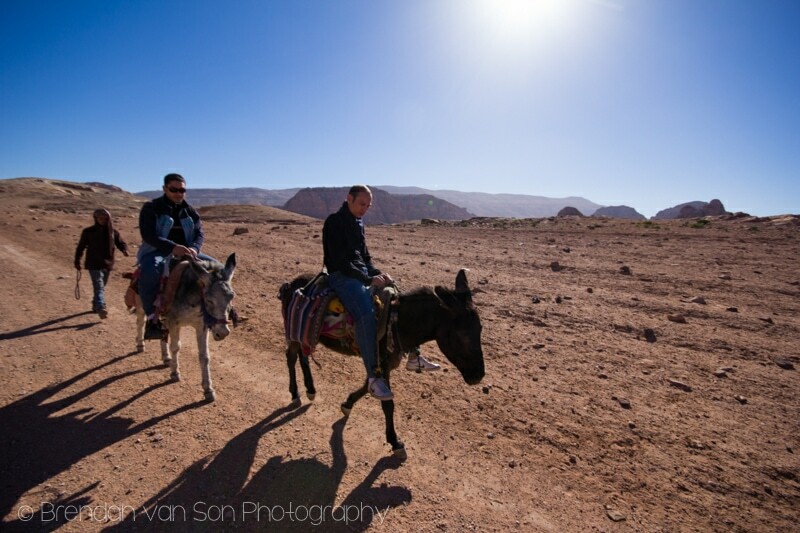 Upon re-arrival to the touristic part of Petra, my donkey and I have become one. We’re on the same page, and the flat land has given us both new life. I’ve pushed ahead of most of the group and am now sprinting around the ancient city yelling “heroin, heroin” at my donkey as camera-strapped tourists look at me like some addicted maniac who has stolen a donkey and is now on a manic search for illicit drugs. When it’s time to say goodbye to my donkey, my heart is with her, but my knees are crumbling and my back is aching. Love this! Shout “Heroin” and your donkey flies. We’ve visited Petra too – but on two feet (our own). 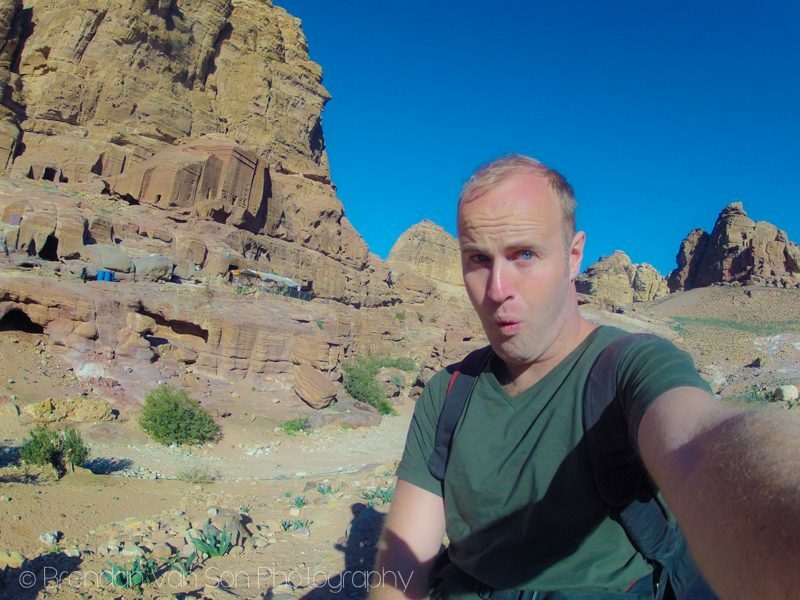 Lots and lots of walking though – but Petra is so worth it! What an adventurous day, beautiful place and excellent photos! looooooooooool i will never forget that day ,my life blinked twice in front of me !